This machine uses a single Roll of Cold Seal Material to make the protective pouch. The unit scores and folds the material so that the product can be placesd in the crease of the web. The sides are brought up and around the product and sealed above. The machine uses pre set length counters to regulate the package size. 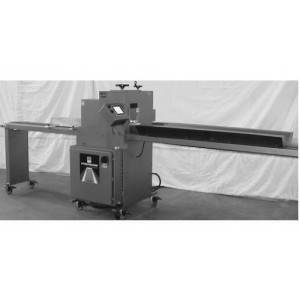 The maximum Width thru the machine is 3-1/2"